Rev-ErbA alpha also known as NR1D1 (nuclear receptor subfamily 1, group D, member 1), is a protein that in humans is encoded by the NR1D1 gene. Rev-erbα is member of the Rev-ErbA family of nuclear receptors and is a transcriptional repressor. In mammals, Rev-erbα is highly expressed in the liver, skeletal muscle, adipose tissue, and the brain, participating in the development and circadian regulation of these tissues. Rev-erbα is transcribed from the opposite strand of the thyroid receptor α (c-erbAα) gene on chromosome 17, with a 269-nucleotide overlap between the two transcripts. The other mammalian isoform of the receptor, Rev-erbβ is encoded by another gene on chromosome 3. 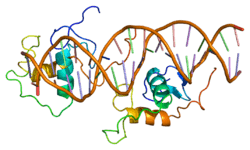 In addition, there is one non-mammalian homolog, the ecdysone-regulated gene E75, which is present in Drosophila and C. elegans. The Rev-erbα gene itself has multiple transcripts. Two promoters govern the expression of the Rev-erbα gene in human and rat, generating two mRNA isoforms. The full-length isoform encodes a 614-amino acid protein, while a second isoform is generated from an internal promoter and produces a protein that is shorter by 106 amino acids. Both Rev-erbα mRNA isoforms contain E-boxes as well as Rev-erbα response elements, which means that they can be regulated in a circadian manner by the BMAL and Rev-erba proteins. In fact, both transcripts exhibit rhythmic expression in serum-synchronized fibroblasts. The Rev-erbα protein is structurally unique from other nuclear receptors, in that it lacks helix 12 (H12) in its ligand-binding domain, which is usually responsible for forming the ligand binding pocket in other nuclear receptors. In place of the missing H12, Rev-erbα displays a hydrophobic interface that binds the corepressor N-CoR, making it a potent transcriptional repressor. Interestingly, all members of the Rev-erb family bind heme, which may act as a ligand to regulate their transcriptional activity. Rev-erbα regulates gene transcription by directly binding to target response elements (RevREs), and comprises an A/T-rich flank followed by AGGTCA. Rev-erbα mediates repression by recruiting the corepressor N-CoR, which then activates the histone deacetylase (HDAC) 3. A number of target genes have been identified for Rev-erbα, including the lipoproteins ApoA1 and ApoCIII, hydratase dehydrogenase, the circadian factor BMAL, and the anti-fibrinolytic factor PAI-1. Many of these genes are coordinately regulated by Rev-erbα and the RAR-related orphan receptor RORα, which share the same response elements but exert opposite effects on gene transcription. Crosstalk between Rev-erbα and RORα likely acts to fine-tune their target physiologic networks, such as circadian rhythms, metabolic homeostasis, and inflammation. Rev-erbα mRNA is induced during adipogenesis and is highly expressed in adipose tissue. One study reported that overexpression of Rev-erbα may enhance adipogenesis in cultured mouse adipocytes, but the mechanism of this effect remains to be elucidated. More recently, a study showed that the deletion of Rev-erbα in mice alters glucose and lipid metabolism and leads to obesity. Rev-erbα expression is also regulated at the post-translational level: it is phosphorylated on the amino terminus by glycogen synthase kinase (GSK 3β), which contributes to its protein stability. It has been shown that lithium, which inhibits GSK3β, can de-stabilize Rev-erbα protein and affect its function in the circadian clock. This may partly explain lithium’s therapeutic effect on circadian diseases such as bipolar disorder. ↑ "Drugs that physically interact with Nuclear receptor subfamily 1 group D member 1 view/edit references on wikidata". ↑ Lazar MA, Jones KE, Chin WW (Mar 1990). "Isolation of a cDNA encoding human Rev-ErbA alpha: transcription from the noncoding DNA strand of a thyroid hormone receptor gene results in a related protein that does not bind thyroid hormone". DNA and Cell Biology. 9 (2): 77–83. doi:10.1089/dna.1990.9.77. PMID 1971514. 1 2 Lazar MA, Hodin RA, Cardona G, Chin WW (Aug 1990). "Gene expression from the c-erbA alpha/Rev-ErbA alpha genomic locus. Potential regulation of alternative splicing by opposite strand transcription". The Journal of Biological Chemistry. 265 (22): 12859–63. PMID 2165488. ↑ Preitner N, Damiola F, Lopez-Molina L, Zakany J, Duboule D, Albrecht U, Schibler U (Jul 2002). "The orphan nuclear receptor REV-ERBalpha controls circadian transcription within the positive limb of the mammalian circadian oscillator". Cell. 110 (2): 251–60. doi:10.1016/S0092-8674(02)00825-5. PMID 12150932. ↑ Triqueneaux G, Thenot S, Kakizawa T, Antoch MP, Safi R, Takahashi JS, Delaunay F, Laudet V (Dec 2004). "The orphan receptor Rev-erbalpha gene is a target of the circadian clock pacemaker". Journal of Molecular Endocrinology. 33 (3): 585–608. doi:10.1677/jme.1.01554. PMID 15591021. ↑ Woo EJ, Jeong DG, Lim MY, Jun Kim S, Kim KJ, Yoon SM, Park BC, Ryu SE (Oct 2007). "Structural insight into the constitutive repression function of the nuclear receptor Rev-erbbeta". Journal of Molecular Biology. 373 (3): 735–44. doi:10.1016/j.jmb.2007.08.037. PMID 17870090. ↑ Raghuram S, Stayrook KR, Huang P, Rogers PM, Nosie AK, McClure DB, Burris LL, Khorasanizadeh S, Burris TP, Rastinejad F (Dec 2007). "Identification of heme as the ligand for the orphan nuclear receptors REV-ERBalpha and REV-ERBbeta". Nature Structural & Molecular Biology. 14 (12): 1207–13. doi:10.1038/nsmb1344. PMC 2743565 . PMID 18037887. ↑ Wang J, Yin L, Lazar MA (Nov 2006). "The orphan nuclear receptor Rev-erb alpha regulates circadian expression of plasminogen activator inhibitor type 1". The Journal of Biological Chemistry. 281 (45): 33842–8. doi:10.1074/jbc.M607873200. PMID 16968709. ↑ Delezie J, Challet E (Dec 2011). "Interactions between metabolism and circadian clocks: reciprocal disturbances". Annals of the New York Academy of Sciences. 1243: 30–46. doi:10.1111/j.1749-6632.2011.06246.x. PMID 22211891. ↑ Forman BM, Chen J, Blumberg B, Kliewer SA, Henshaw R, Ong ES, Evans RM (Sep 1994). "Cross-talk among ROR alpha 1 and the Rev-erb family of orphan nuclear receptors". Molecular Endocrinology. 8 (9): 1253–61. doi:10.1210/me.8.9.1253. PMID 7838158. ↑ Fontaine C, Dubois G, Duguay Y, Helledie T, Vu-Dac N, Gervois P, Soncin F, Mandrup S, Fruchart JC, Fruchart-Najib J, Staels B (Sep 2003). "The orphan nuclear receptor Rev-Erbalpha is a peroxisome proliferator-activated receptor (PPAR) gamma target gene and promotes PPARgamma-induced adipocyte differentiation". The Journal of Biological Chemistry. 278 (39): 37672–80. doi:10.1074/jbc.M304664200. PMID 12821652. ↑ Chawla A, Lazar MA (Aug 1993). "Induction of Rev-ErbA alpha, an orphan receptor encoded on the opposite strand of the alpha-thyroid hormone receptor gene, during adipocyte differentiation". The Journal of Biological Chemistry. 268 (22): 16265–9. PMID 8344913. ↑ Delezie J, Dumont S, Dardente H, Oudart H, Gréchez-Cassiau A, Klosen P, Teboul M, Delaunay F, Pévet P, Challet E (Aug 2012). "The nuclear receptor REV-ERBα is required for the daily balance of carbohydrate and lipid metabolism". FASEB Journal. 26 (8): 3321–35. doi:10.1096/fj.12-208751. PMID 22562834. ↑ Yin L, Wang J, Klein PS, Lazar MA (Feb 2006). "Nuclear receptor Rev-erbalpha is a critical lithium-sensitive component of the circadian clock". Science. 311 (5763): 1002–5. doi:10.1126/science.1121613. PMID 16484495. Adelmant G, Bègue A, Stéhelin D, Laudet V (Apr 1996). "A functional Rev-erb alpha responsive element located in the human Rev-erb alpha promoter mediates a repressing activity". Proceedings of the National Academy of Sciences of the United States of America. 93 (8): 3553–8. doi:10.1073/pnas.93.8.3553. PMC 39648 . PMID 8622974. Downes M, Burke LJ, Bailey PJ, Muscat GE (Nov 1996). "Two receptor interaction domains in the corepressor, N-CoR/RIP13, are required for an efficient interaction with Rev-erbA alpha and RVR: physical association is dependent on the E region of the orphan receptors". Nucleic Acids Research. 24 (22): 4379–86. doi:10.1093/nar/24.22.4379. PMC 146280 . PMID 8948627. Burke LJ, Downes M, Laudet V, Muscat GE (Feb 1998). "Identification and characterization of a novel corepressor interaction region in RVR and Rev-erbA alpha". Molecular Endocrinology. 12 (2): 248–62. doi:10.1210/me.12.2.248. PMID 9482666. Zhao Q, Khorasanizadeh S, Miyoshi Y, Lazar MA, Rastinejad F (May 1998). "Structural elements of an orphan nuclear receptor-DNA complex". Molecular Cell. 1 (6): 849–61. doi:10.1016/S1097-2765(00)80084-2. PMID 9660968. Sierk ML, Zhao Q, Rastinejad F (Oct 2001). "DNA deformability as a recognition feature in the reverb response element". Biochemistry. 40 (43): 12833–43. doi:10.1021/bi011086r. PMID 11669620. Coste H, Rodríguez JC (Jul 2002). "Orphan nuclear hormone receptor Rev-erbalpha regulates the human apolipoprotein CIII promoter". The Journal of Biological Chemistry. 277 (30): 27120–9. doi:10.1074/jbc.M203421200. PMID 12021280. Delerive P, Chin WW, Suen CS (Sep 2002). "Identification of Reverb(alpha) as a novel ROR(alpha) target gene". The Journal of Biological Chemistry. 277 (38): 35013–8. doi:10.1074/jbc.M202979200. PMID 12114512. Raspè E, Mautino G, Duval C, Fontaine C, Duez H, Barbier O, Monte D, Fruchart J, Fruchart JC, Staels B (Dec 2002). "Transcriptional regulation of human Rev-erbalpha gene expression by the orphan nuclear receptor retinoic acid-related orphan receptor alpha". The Journal of Biological Chemistry. 277 (51): 49275–81. doi:10.1074/jbc.M206215200. PMID 12377782. Raspé E, Duez H, Mansén A, Fontaine C, Fiévet C, Fruchart JC, Vennström B, Staels B (Dec 2002). "Identification of Rev-erbalpha as a physiological repressor of apoC-III gene transcription". Journal of Lipid Research. 43 (12): 2172–9. doi:10.1194/jlr.M200386-JLR200. PMID 12454280. Chopin-Delannoy S, Thénot S, Delaunay F, Buisine E, Begue A, Duterque-Coquillaud M, Laudet V (Apr 2003). "A specific and unusual nuclear localization signal in the DNA binding domain of the Rev-erb orphan receptors". Journal of Molecular Endocrinology. 30 (2): 197–211. doi:10.1677/jme.0.0300197. PMID 12683943. Fontaine C, Dubois G, Duguay Y, Helledie T, Vu-Dac N, Gervois P, Soncin F, Mandrup S, Fruchart JC, Fruchart-Najib J, Staels B (Sep 2003). "The orphan nuclear receptor Rev-Erbalpha is a peroxisome proliferator-activated receptor (PPAR) gamma target gene and promotes PPARgamma-induced adipocyte differentiation". The Journal of Biological Chemistry. 278 (39): 37672–80. doi:10.1074/jbc.M304664200. PMID 12821652. Johnson JM, Castle J, Garrett-Engele P, Kan Z, Loerch PM, Armour CD, Santos R, Schadt EE, Stoughton R, Shoemaker DD (Dec 2003). "Genome-wide survey of human alternative pre-mRNA splicing with exon junction microarrays". Science. 302 (5653): 2141–4. doi:10.1126/science.1090100. PMID 14684825. Migita H, Morser J, Kawai K (Mar 2004). "Rev-erbalpha upregulates NF-kappaB-responsive genes in vascular smooth muscle cells". FEBS Letters. 561 (1-3): 69–74. doi:10.1016/S0014-5793(04)00118-8. PMID 15013753. Cheng H, Khanna H, Oh EC, Hicks D, Mitton KP, Swaroop A (Aug 2004). "Photoreceptor-specific nuclear receptor NR2E3 functions as a transcriptional activator in rod photoreceptors". Human Molecular Genetics. 13 (15): 1563–75. doi:10.1093/hmg/ddh173. PMID 15190009.